High ambient temperatures compromise performance and productivity through reducing feed intake and decreasing nutrient utilization, growth rate, egg production, egg quality and feed efficiency, which lead to economic losses in poultry. 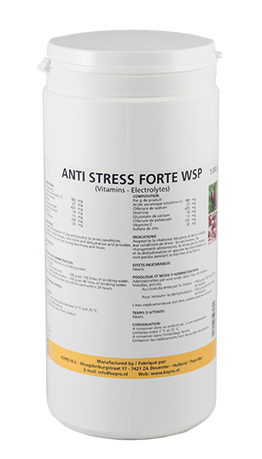 Environmental stress like heat stress also leads to oxidative stress associated with a reduced antioxidant status in the bird, as reflected by increased oxidative damage and lowered plasma concentrations of antioxidant vitamins (vitamins E and C) and minerals like Zinc. Zinc has an important role in numerous biological processes in avian and mammalian species. Dextrose, sodium chloride, calcium gluconate and potassium chloride help to restore the electrolyte balance in stressed or dehydrated birds. Increases the resistance of pigs and poultry to stress conditions: vaccination, food changes, heat stress and dehydration and provides electrolytes which are lost during diarrhoea and fever. During heat stress : 100 g per 120 litres of drinking water. Restoring dehydration : 100 g per 80 litres of drinking water.